The triumphant 30th anniversary bash at Chiswick House was captured in 24-track glory for posterity, and was released on CD during the 2000 UK Tour. It's a splendid memento of an unparalleled Strawbs experience. The various line-ups, rehearsed and led by Dave Cousins, produced some memorable music that day. Dave himself was hardly off the stage, and had spent weeks setting up rehearsals with his former bandmates. Dozens of former Strawbs were there, though Ron Chesterman and Tony Fernandez didn't take part in the show. Sadly keyboard players Rick Wakeman, John Hawken and Andy Richards were missing, their role however admirably filled by Adam Wakeman. And guest stars, too: Ric Sanders from Fairport showed what Strawbs would be like with violin added to the musical mix; and Cathryn Craig's great voice in a duet with DC on "Further Down The Road". 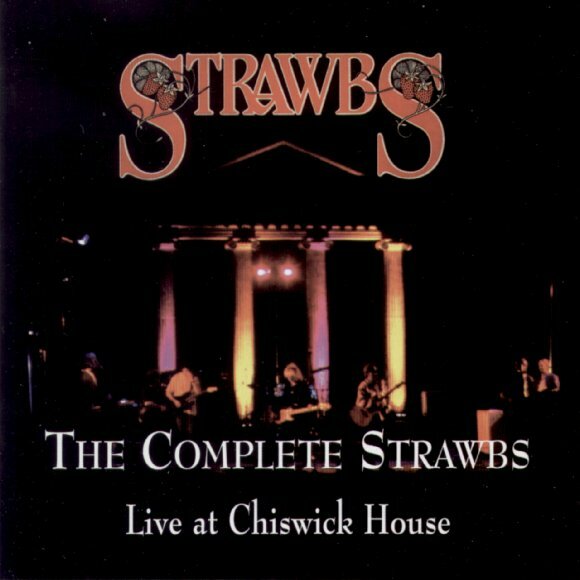 And the process of setting up the show, it would seem, kickstarted the Strawbs' renaissance. Prior to Chiswick, performances had been few and far between, but the following year saw the electric (BATS plus Brian) band reform for annual touring in the UK (and a brief trip to Norway in 1999), much appreciated by the UK fans. There were countless reviews and comments on the original live show, so there isn't a reviews page for this CD - see the 30 Years On main page for everything Chiswick-related. CD: WC CD2001 (Witchwood, 2000). The first release on the Strawbs' own label, the 8pp booklet is nicely printed, with photos from the event and details of who played what on which track. DVD: WMDVD 2006 (Witchwood Media, 2002). Dave Cousins hired some cameramen to film the Chiswick show and, together with some fan footage which helped to fill a few gaps, this is an excellent memento of a fabulous day. See The Complete Strawbs DVD page for more information. "My earliest memories are of growing up in Airedale Avenue just a few hundred yards from Chiswick House, but sadly the house I lived in was flattened to make way for the Hogarth Roundabout. Still�.I moved back to Chiswick in 1995 so what better place to celebrate the band's first thirty years. The grounds of Chiswick House are the pride of West London and the Amphitheatre has a magic of its own. Friends came from all over the country, and from further afield � the States and Canada, Scandanavia, even Australia � to share with us. Four different eras of the band � the early days of Eel Pie Island and Strawberry Hill, the crazy days of chart singles, seventeen tours of North America in five years, and the more recent vintage. Then our special guests � Ric Sanders from Fairport, Cathryn Craig from Nashville, and Adam Wakeman, a real chip off the old block. It was probably the happiest day of my life." Very special thanks to Hounslow Leisure Services for allowing us to play in the Amphitheatre.